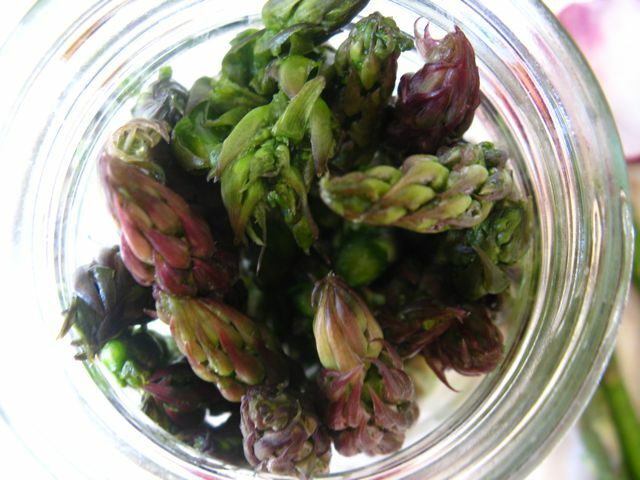 I started with the asparagus pickling. Part of the reason nothing every really works quite right for me is that I never do the same thing twice. I really liked the pickled asparagus I made last summer, even though the recipe kind of bewildered me, so I decided I’d try it again and try not to screw it up this time. Again, as last year, I bought the asparagus weeks ago, but at least this time there was no mold, it was actually really sturdy and pretty. I felt sad salting it. One of the reasons I don’t can or pickle as much as I’d like is that my canner is HUGE and just waiting for the water to boil takes more time than I usually want to devote. I’m hoping to experiment this summer with some different equipment. I saw this post about small batch canning the other day, and now I really want an asparagus pot, but for today I just ended up using a stockpot, which is really only slightly smaller than my canner. I definitely think it cut down on the timesuck though. Of course, my canning rack didn’t fit in there, so I stole this awesome idea from Northwest Edible Life, and because my stockpot was pretty skinny I only needed to use a couple of random rings I had laying around. Ingenuity! So, of course, as the jars were sterilizing I started to put together the pickling liquid, and had nothing I was supposed to have, apart from the vinegar and sugar. I used the same black mustard seed as last year instead of regular mustard seed, because it turned out fine. Frustratingly, I could never find dill seed to use last year, found the unopened jar a week later, and then couldn’t find it again this year. And totally forgot to buy an onion for it. So…I ended up using the black mustard seed and then randomly throwing in some white peppercorns and juniper berries? Because…they were the size and shape of what I wanted? That truly was the extent of my reasoning. I had counted out thirty asparagus and chopped them so they’d fit into the jar, and that was what I salted. I packed them all in to the jar, poured the pickling liquid in, and was feeling all pleased…until I remembered that I had a whole other jar that was supposed to be full of asparagus. So, in true half-assed fashion, I just snapped off the very ends of the chopped parts and dumped them into the jar, which actually filled it up. So maybe…I just don’t know. Is it supposed to be each asparagus cut in half or something? I still find it bewildering. And, I poured in the liquid and it came up only half way. Again. Just like last year. 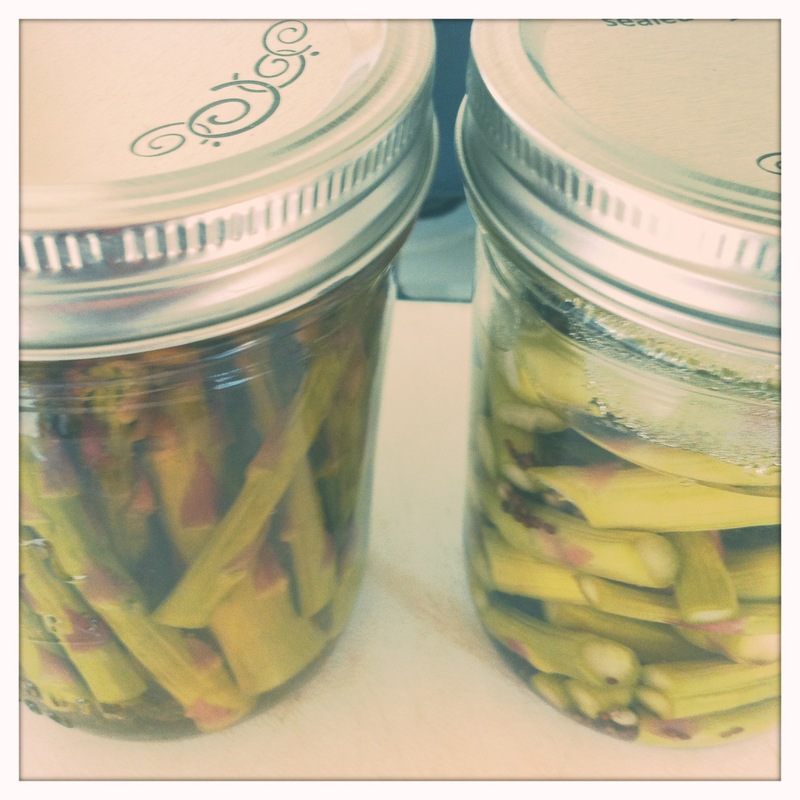 So, I processed it, and now I have one beautiful asparagus pickle jar, and one half full of weird choppy bits jar. I will use them in salads I think. I’ll leave my other adventures for tomorrow, but I have to say that I feel really happy and proud to be failing in my kitchen again. My goal for the summer is to work on being more realistic about what I can do during the schoolyear, and to practice skills. I want to get more into small-batch processing, and I’m working a lot from this book Make the Butter, Buy the Bread which I wish I’d written, about what is easy and worth it to make at home and what you should just admit is easier to pick up at the New Seasons. I may have made several discoveries about that today…which I will share with you soon! 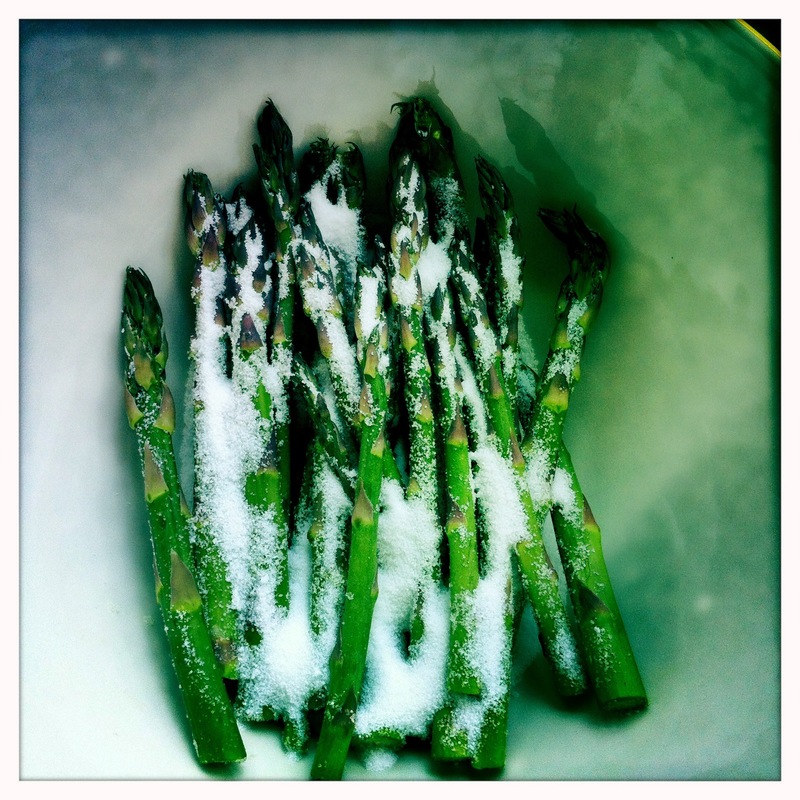 Asparagus season is long gone. 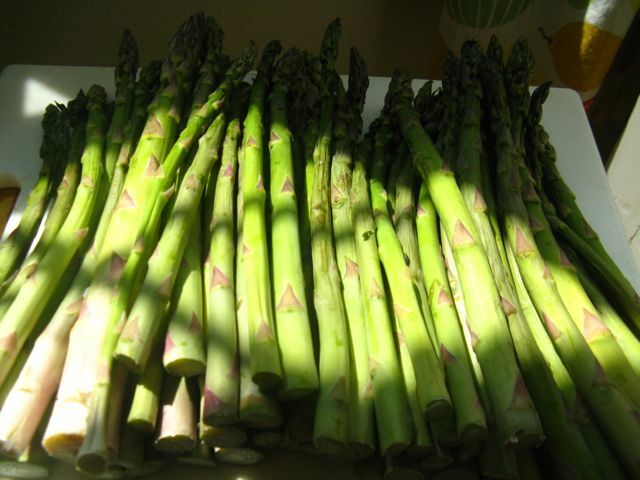 But about two, maybe even three weeks ago, the farmer’s market still had the last few asparaguses (asparagi?) and I decided it would be worth it to try to pickle a few and have them for the winter. We try pretty hard to eat seasonally appropriate produce anyway, but asparagus is one thing that I just refuse to eat out of season. I am not paying $5 a pound for some woody green grossness from Mexico. And canned asparagus? Frozen asparagus? Those are abominations. But I will eat just about anything pickled. So, this pickling event was an exercise in how many ways I could possibly be half-assed. Or you could call it an adventure, depends on how you look at it. I am looking at it as an adventure until I poison my family. I was going off this recipe from a local farmer’s market. I liked it because it was only supposed to make a few jars and I didn’t want to spend fifty dollars on asparagus, and realistically? How many jars of pickled asparagus can one family eat? First off, as I said, this asparagus was at least two weeks old when I finally got around to doing this. Probably half of it was floppy, and there was even some mold. Moldy asparagus went into the compost, floppy but not yummy looking went to the chickens. Depressing. I hate that I wasted asparagus. 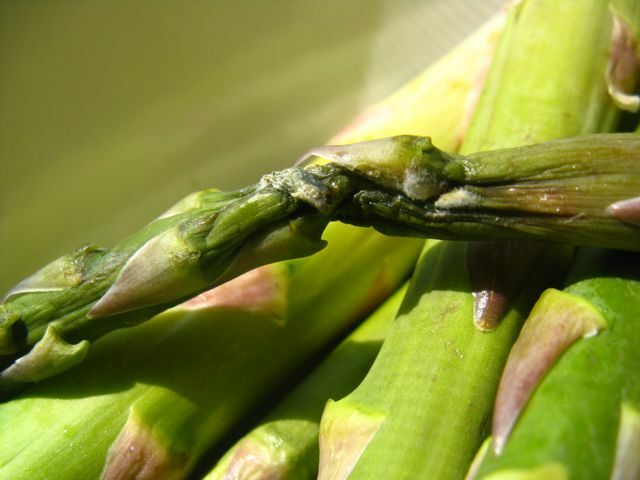 Also, I can’t help but fear that some of the mold from the asparagus got into the ones I canned and is now breeding there, waiting to poison and kill us all. So when the jars were sterilized, the asparagus had brined for a couple hours and I had boiled the vinegar mix for one minute exactly, it was time to fill the jars. I reached into the fridge and pulled out the dill, which was, of course, as old as the asparagus but had not held up as well. It was crispy. I decided, hey, that’s what water is for. It will rehydrate. 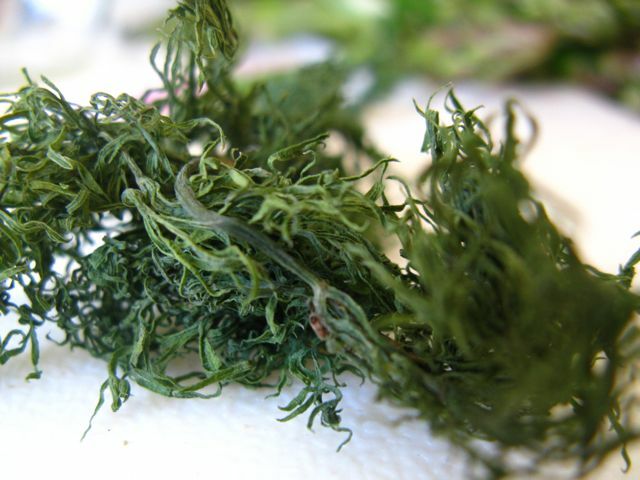 It’s the same as using dried dill. 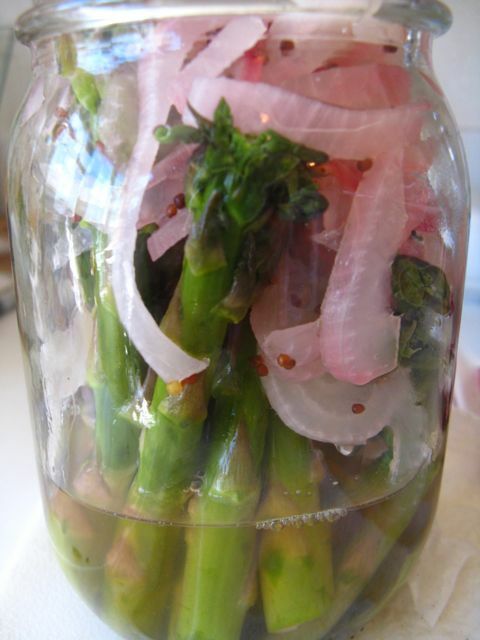 I carefully packed the asparagus, tips up, into the first jar until there was no more room. Then I went to ladle the hot vinegar in. 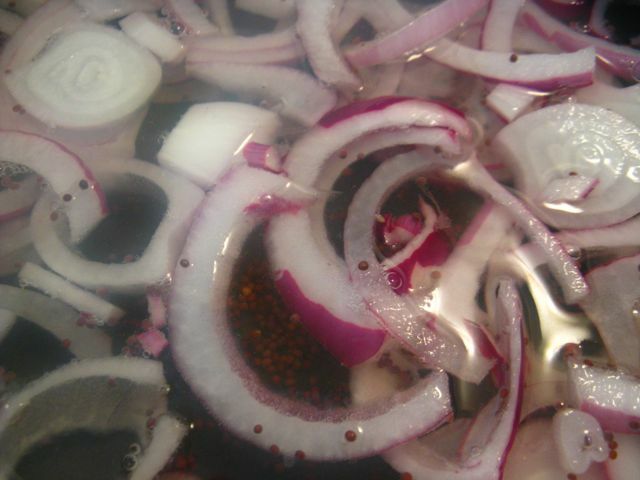 But the recipe doesn’t say anything about whether the onions are actually supposed to go into the jars, or whether it was just in there to flavor the vinegar? Since the jar was pretty full and the onions didn’t seem to want to go through the funnel, I decided to just put the vinegar liquid in. Filled it up, screwed on the lid, and into the canner it went. Perfect. Of course, until I did the second jar. I could tell immediately that there was not nearly enough vinegar to fill the jar up. I ladled it all in and it came, maybe, to a third of the way up. I decided to just put all all the onions in then to take up some space, but the jar was so full of asparagus that I spent a good long while shoving the onions in with a chopstick. I finally got them in and the vinegar had risen by maybe an inch. Once again, dammit. I screwed the lid on and realized I’d just have to eat these sooner rather than later, but put then in the canner anyway. Why? I don’t know. It’s not like they’d process properly, but this is the way my brain works. I put the jar in there and it actually bobbed tragically about, mocking me. 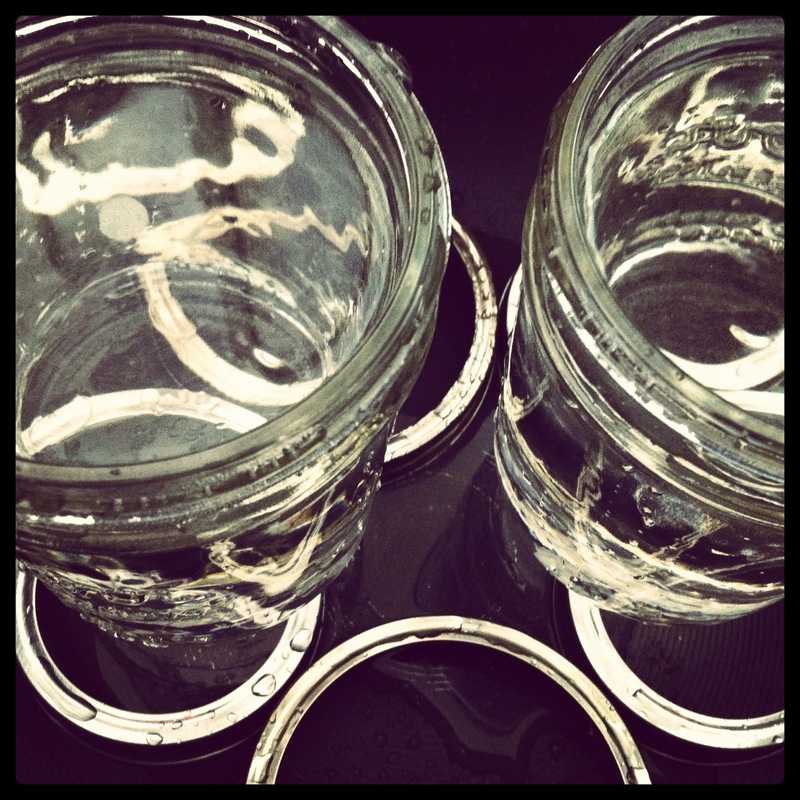 Processed the jars and took them out. I have to admit, one of my favorite things about canning is actually my pretty canning labels and getting to write in my best cursive in my grey sharpie on them. As I applied the label to the unfortunate second jar, I noticed the fluid inside now appeared to be halfway up…definitely more than there had been. Under closer inspection I realized that, as a final show of how truly half-assed I am, I hadn’t even screwed the damn ring on properly and water had leaked in. I truly am a failure. On the upside, the asparagus is actually really, really delicious. Obviously I can’t keep the half full one because we’d all die, so I’m going to use it in a recipe later this week. I think as long as it hasn’t been infected by mold the other one will keep and I’ll open it mid-winter when a little bit of spring will be much needed. And I will continue to pickle and can and jam and otherwise preserve and try hard to laugh at myself rather than getting discouraged.